Red Hot Blue Glue® is the Original all-weather, wet or dry, rain or shine PVC solvent cement. It's the preferred solvent cement of many professional contractors, fitting manufacturers, spa manufacturers and repair professionals. 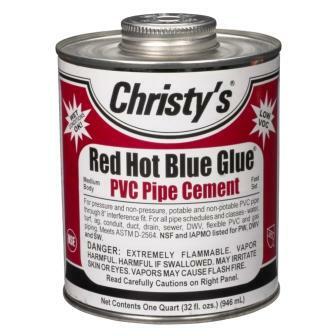 Red Hot Blue Glue® is a very aggressive, blue, medium bodied, fast setting PVC solvent cement. It is chemically the “hottest” solvent cement formulation available on the market today. It is designed to be used on all schedules and classes of PVC pipe through 6", schedule 80 through 4". Red Hot is ideal for both quick pressurization and demanding conditions. Red Hot is our best solvent for all PVC applications through 6", including wet or cold condition applications. Bonds flexible PVC pipe to coupling in BIOFALLS Filter & Skimmers. Designed for flexible & ridgid PVC pipe. Red Hot does not require the use of a purple primer, unless specified by local code because it dries with a blue color. Suitable for potable water, DWV, sewer, conduit, sprinkler, pool, spa and PVC flex-vinyl applications. Conforms to South Coast Air Quality Management District (SCAQMD) Rule 1168/316A. Working in freezing termperatures is difficult, if unavoidable. Red Hot Blue Glue® is the finest available for extreme conditions. Red Hot Blue Glue® has EXCELLENT COLD WEATHER STABILITY for virtually all practical applications. By following our standard instructions and using a little extra care and patience, successful solvent cemented joints can be made at tempertatures even as low as 10° F. In cold weather, solvents penetrate and soften the plastic surfaces more slowly than in warm weather. Also, the plastic is more resistant to solvent attack. Therefore, it becomes even more important to presoften surfaces with Purple Primer. Longer cure times are also necessary. The cure schedules printed in our technical brochure allow a wide margin for safety, but for colder weather, more time should be allowed. Prefabricate as much of the system as is possible in a heated and ventilated work area. Store cements and primers in a warm area when not in use and make sure they remain fluid. Store fittings in a warmer area if possible as well. Take special care to remove dirt, moisture including ice and snow from the surfaces to be joined. Use primer to soften the joining surfaces before applying cement. More than one application may be necessary. Aggressively “Scrub” primer into pipe surface until milky. Be sure to apply solvent cement “ male-female-male” sequentially-per directions on can. Wipe-off excess cement and solvent bead. Allow a longer cure period before the system is used. Read and follow all of our directions carefully before installation. IT IS TO HAVE QUALITY INSTALLATION!! From Anonymous of Round Hill, Virginia on 9/4/2013 . 3/5/2018 – Can I use this on PVC Electrical Conduit, too? Or do I need a different product? 12/4/2015 – Does this glue dry blue or does it dry clear? 8/8/2014 – how can fast the glue can dry? 12/9/2012 – Is it safe to drink the water from the blue glued pipe to the house. It has bad smell for few days.